On Saturday two of our friends threw a leaving party. At the end of December they leave for Australia where they plan to spend year at absolute minimum, more likely two with very little likelihood that they’ll make it back for our wedding next summer. Three other friends have already made the move down under. None have returned so far: easy enough to understand when you’re living in the land of sun, sea, surf and Adriano Zumbo. When I was in Sydney I was completely seduced by the way of life, the outdoor activities, the lovely people and incredible food . . . Australia is an amazing place and I’m pretty positive we won’t be seeing these friends for a while. To send them off, give them a little taste of what’s in store (and remind them what they’re missing), I decided to make some lamingtons. 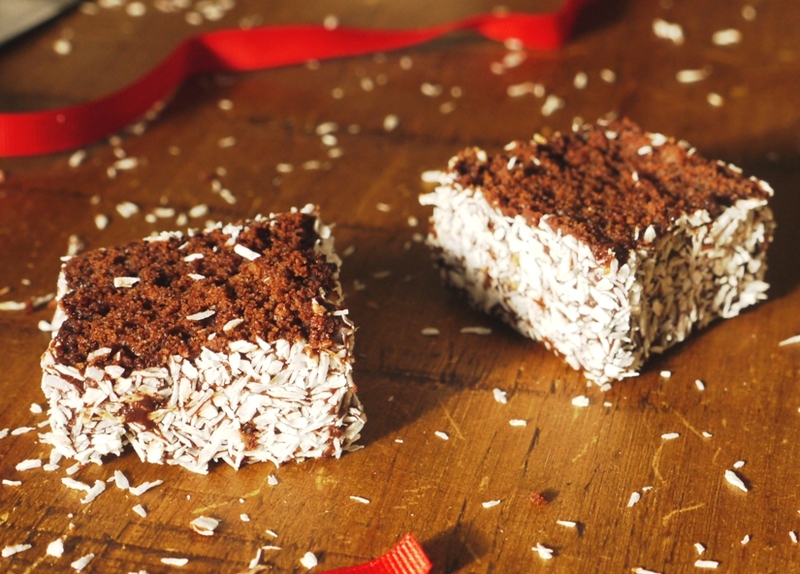 Named after the Governor of Queensland, a traditional lamington is a simple sponge cloaked in chocolate icing and rolled in dessicated coconut. With so few ingredients they can be utterly delicious – moist, buttery sponge and a thick chocolaty coating – or disappointingly dry, bland and boring. 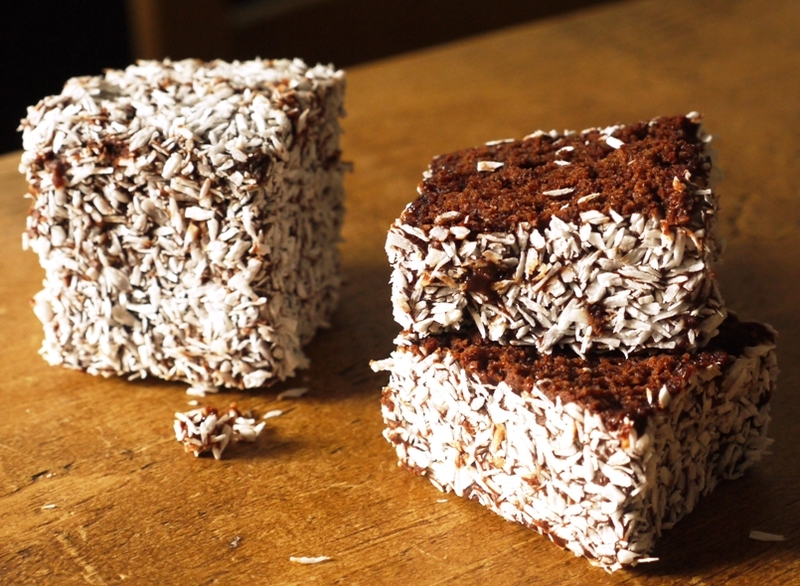 Lamington purists look away now. I used a Dan Lepard recipe from an article on the Guardian website which provoked some serious outrage in the comments box below. In much the same way the Women’s Institute refuse to allow any filling other than jam in a classic Victoria sponge, it appears lamington lovers can be loath to accept variations on the original. This recipe involves not just a chocolate coating but a super moist chocolate sponge. Dissenters please bear with me: Dan knows what he’s talking about and it’s really, seriously delicious. 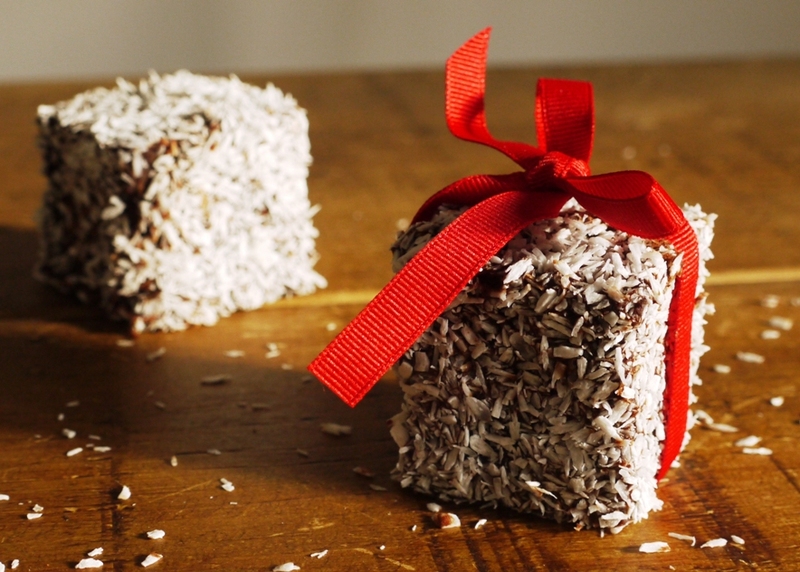 With Christmas just around the corner, these lamingtons would make the perfect dessert or tea time treat, regardless of whether you or anyone you know has any connection with Australia. The sponge is rich and moist yet light, melting into the double-dipped thick chocolate coating and contrasting against sweet shards of crumbly coconut. The square, present-like shape means they look cute as a button wrapped up in ribbon and they’re sturdy enough to pack into boxes and give out as gifts. Which is exactly what I did on Saturday. We won’t be seeing our friends for a while, but hopefully every time they eat a lamington while they’re away, they’ll think of us. I followed Dan’s original recipe pretty much to the word, so haven’t replicated here. Head on over to the Guardian website to read it in full. The only tweaks I made were to double dip each square for a thicker chocolate coating, thereby using up the full quantity, and to cut the cake into 16 pieces rather than 9. I’ve been so intrigued by lamingtons for ages and these look so gorgeous I’m definitely going to give them a go. I like the idea of giving them as gifts. WellAustralia is definitely the place to be! These lamingtons look delicious! I’ve never made them and I live in Australia but apparently they aren’t the easiest. I don’t like the classic with the overly dry plain cake, but double chocolate, well now you’re talking! Frugal Feeding – the bows are a bit of a faff, but look pretty! Food & Forage – enjoy! Sophie – would love to hear how you get on with them. Clare – this recipe was super simple, definitely recommend it if you’ve never made them before. Jennifer – the double chocolate is so good, really moist sponge then a lovely layer of icing. Oh my! I am taking this recipe with my to my relatives’ house over the holidays so they can make this for me. I mean, for all of us. I love a good lamington and this looks awesome! Yum! I love lamingtons but haven’t made them in ages. When I lived in New Zealand we did both a chocolate dipped and strawberry dipped version. Chocolate sponge sounds like it would be fantastic, laminton purists be damned! Thanks for posting this, I’ll definitely be trying it out. I’ve always wondered what a Lamington was – they sound really delicious especially with that double chocolate dipping! Those lamingtons look fabulous! My husband and I gave Australia a go and while the sunshine/ food/ wine was excellent ultimately I missed my friends too much to stay. So maybe it wont be too long before you see your chums again! Adorable! I wish I was moving to Australia…the cold up in York is really getting to me! Maybe I’ll make myself some of these for a little taste of sunshine! I’ve never tried them and am curious. And who cares about the purists – Dan Lepard’s recipes are ALWAYS great! I must try these and a lovely idea to give a gift to people leaving. The chocolate sponge is a fabulous innovation! I like the small size too – much better sponge to chocolate ratio. Muffin Myth – I’ve heard of people putting a layer of jam in the middle too – kind of like a doughnut I guess. Yum. Kathryn – the extra thick chocolate layer is really good, highly recommend. Lemony Loves Baking – either that or we’ll have to go and visit them 🙂 Any excuse for a trip to Australia! Love Hound – glad you like them. Stephanie – Dan’s recipe would make absolute whoppers! I like having a good bite of icing with every mouthful. 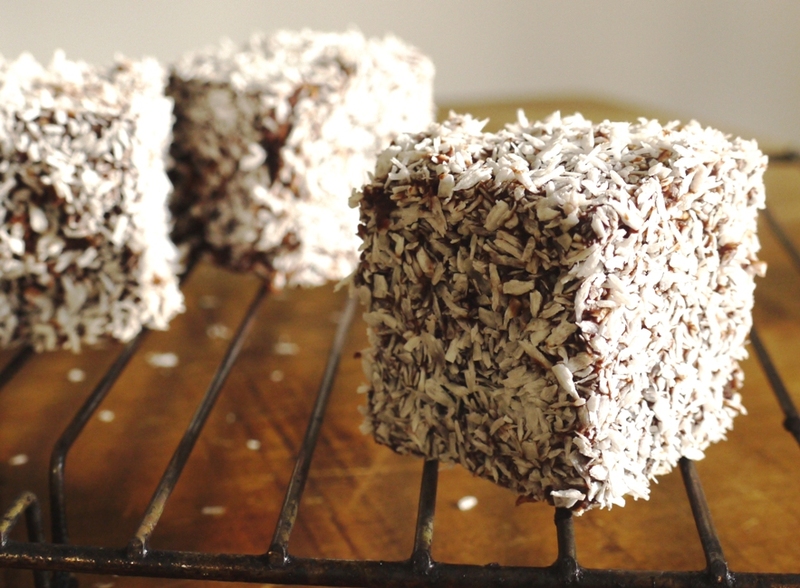 I’ve still never made lamingtons, I keep leaving them until January assuming Pete at Delicious Delicious Delicious will do his annual lamington event. These look great! This is great! I have an Aussie friend who loves Lamingtons! Must try this recipe. I love that this has a chocolate sponge! What a cunning way to get your friends to remember you 🙂 With all the friends you’ve got out there it sounds like you might need to plan a trip to visit them! The double chocolate version sounds fantastic and I think these would be really popular to make with my sons, if not slightly messy. They look very, very scrumptious indeed! Sarah – an annual lamington event? Sounds amazing! Lorraine – that sounds amazing, heading over to check out the recipe now! Baking Not Writing – hope they like it! Crushland – the chocolate sponge is really yummy. Jaime – thank you. Love the word ‘scrumptious’. Oh, they look divine! 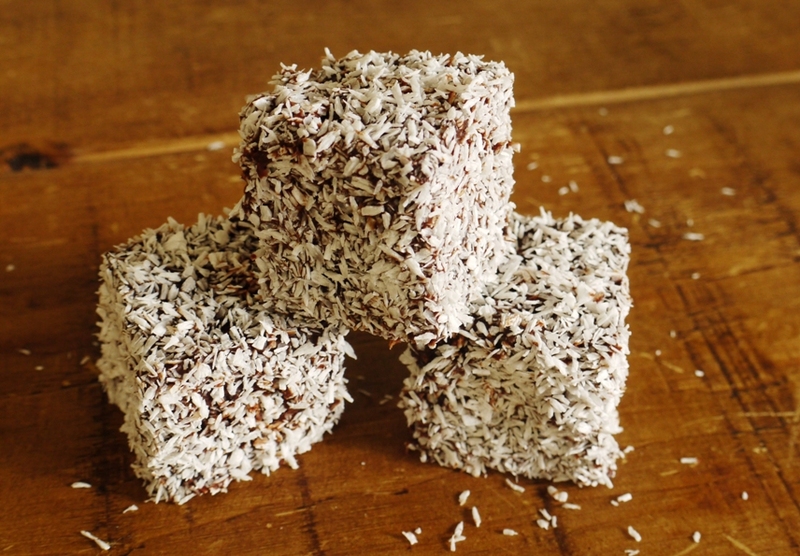 I miss lamingtons so bad. I gorged on them when I last visited home, but as of late I’ve been starting to crave them once again. Thank you so much for linking the recipe. Hopefully I’ll be able to make these soon.